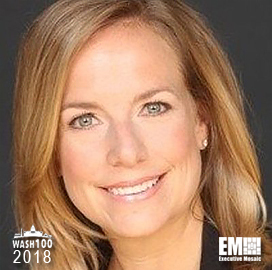 Executive Mosaic is honored to announce that Kirstjen Nielsen, Secretary of Homeland Security at the Department of Homeland Security (DHS), has been added into the 2018 edition of the Wash100 — Executive Mosaic’s annual selection of the most influential voices in the government contracting arena–for innovation and leadership in risk management and security. Kirstjen Nielsen was confirmed as Secretary of Homeland Security on December 5, 2017 and was sworn into office the following day. Her confirmation came two months after President Trump nominated her for the DHS chief post in October. Nielsen, who previously worked for the Department of Homeland Security in its infancy as Director of the Office of Legislative Policy in the newly-created Transportation Security Administration. Nielsen also served during the Bush administration as special assistant to the president, where she was tasked with serving as an information liaison to President George W. Bush when Hurricane Katrina made landfall on the nation’s southern coastline in 2005. Nielsen left the White House in 2007 to join the private sector, where she served as general counsel and managing director of the national security division of Civitas Group, a strategic advisory and investment firm serving the homeland and national security markets. In 2012, she founded Sunesis Consulting, providing invaluable input on preparedness strategies, particularly that of infrastructure and associated items. Nielsen also served as a Chair of the World Economic Forum’s Global Agenda Council on Risk and Resilience and is a senior fellow at George Washington University’s Center for Cyber and Homeland Security. As of December 6, 2017, she has been responsible for the oversight of DHS, a federal agency that runs with approximately 250,000 employees, 22 sub-agencies, and an annual budget of $40 billion. Nielsen is responsible for all that comes with keeping the United States safe and secure such as counter-terrorism efforts, immigration enforcement, disaster preparedness, and transportation security, among other pressing issues of homeland security importance. Nielsen told the Senate Committee on Homeland Security and Government Affairs that she would help DHS implement a “holistic” approach in recruitment efforts, Federal News Radio reported. “The DHS can address [operations] through a combination of both personnel and technology,” she stated. For her wealth of knowledge and vast experience, Nielsen was awarded the Most Influential People in Security 2016 award and currently serves on the board of the Risk Assistance Network and Exchange (RANF) organization. Executive Mosaic congratulates Secretary Nielsen and the DHS team for her selection to receive this award.